Tunmun is all over the house. And we are behind her. She is crawling up the stairs. Pulling those wires. Reaching everything that is not edible and putting it in her mouth. And CRYING HARD when you don’t let her do what she wants to do! I had realised early on that Tunmun has a mind of her own, but now I know that she is also hell bent on doing her own thing!!! That said, she’s become such an adorable little baby that I never tire of cuddling her. But she pushes me and fights hard to be let down so that she can continue creating a racket. Bhaiya contiues to be the friend, philosopher and guide. They have started enjoying each other’s company already. 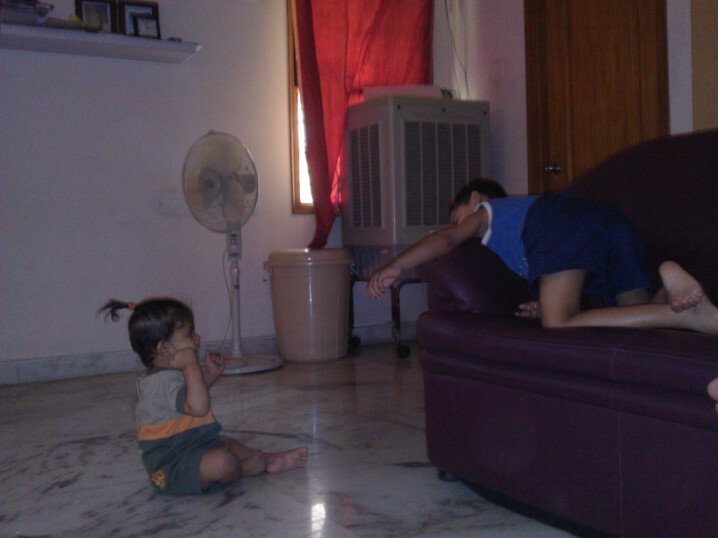 One day Vibhu woke me up in the morning ( okey, it was past 8 ) and showed me that my two kids were already up and playing with each other without disturbing me. I couldn’t help smiling like a content cat :). Like I am doing right now while writing this post.